Clixsense and Neobux are the two giants of paid to click industry. Both these sites are legitimate and paying for over a decade which is a good news for freelancers who are tired of getting scammed. They are the only PTC sites with largest member base in PTC industry. These sites have more earning opportunities other than paid to click like Surveys, offers and tasks so they are eligible to be called as GPT brand. 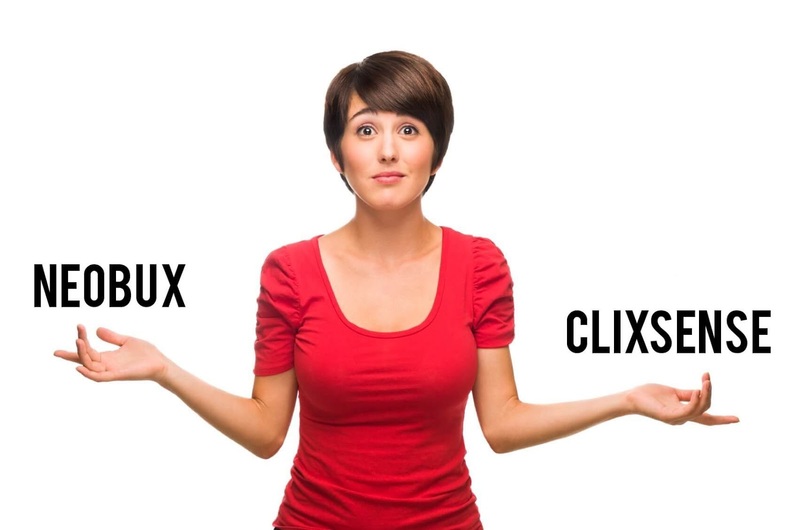 Clixsense and neobux has its own pros & cons and it is very tough to pick the best among them. I’m a member on these sites for several year and in this article I’ve compared them on various factors based on my experience. Clixsense and neobux are compared based on various factors that is rated from 1 to 10. A clear explanation has been given for each features and rated below. These sites are compared under three sections General factors, important factors and critical factors. The critical factors should has more influence on earnings. This section contains reviews about factors that has least influence on earnings of PTC sites. These factors are rated from 1 – 5. Site layout is a basic factor that has to be taken into consideration while comparing websites. Site layout should be clean, easy to navigate, properly designed with colors that don’t produce stress on our eyes. Clixsense has good site layout that is designed very well by the developers. The colors used on clixsense best suits for long time view. Seeing the pages of clixsense continuously for few minutes will not stress our eyes. The site navigation is very easy to understand for beginners. Menu has the links to all the earning activities make it easier to navigate to individual page in one click. On the whole clixsense is designed very well as a GPT site. Neobux is also designed very well with easily navigable site layout. Neobux has good color combination and members will not feel stressed while navigating the site. The site’s navigation menu is designed well, but it could have been better by adding links to all possible important inner pages, so that beginners can navigate without any confusion. Score : Clixsense – 5 | Neobux 4.5. Site speed is very important to complete work ASAP. Slower sites are always frustrating and it can increase bounce rate, reduce conversions. Clixsense loads very quickly within 2 seconds after request which is a good sign. But, they have to still improve their page until the website loads within a second. Neobux is designed for speed. It loads within few milli-seconds which is 10 times higher than clixsense. So user experience will be very high on neobux compared to clixsense. Score : Clixsense – 3.5 | Neobux – 5. Viewing ads is the primary task on both clixsense and neobux. It is very important to optimize the site to help member to see ads quickly without any trouble. Viewing ads on clixsense is very easy, but it takes little bit more time for ad to be validated completely compared to neobux. Neobux has optimized their ad view tasks very well. We can watch ads very fast on neobux compared to clixsense. This feature does not have major influence, still we can save few seconds on neobux. In this section we compare some important factors of a PTC site like support, report, guides and statistics. Related link – Offline data entry jobs. FAQ section is a important section that should clear all the doubts of the members and guide beginners to understand about basics of the site. Also, a good support will make it even better. When we join clixsense, a welcome video will be shown that tells us everything we should know about that site within 3 minutes which makes it easier for beginners to start their work right away. Apart from that clixsense FAQ section is well organized and answers almost all the frequently asked questions very clearly. If there is no answer we can get help from support within few minutes after submitting a ticket. Neobux FAQ section is well organized. If we click FAQ, a pop up window will open and the FAQ will be under different sections makes it easy to find what we are looking for. But there are only few FAQs answered and lot of questions are unanswered in FAQ section. So they should try to improve their FAQ section to help their members to find everything without confusion. Neobux support is good as clixsense support and in addition live support is available for limited time. Score : Clixsense – 5 | Neobux – 4. GPT sites should add statistics and reports section that will be very helpful for members to analyse their work history and to improve their future earnings. Clixsense has unbeatable stats section for each and every action made by the members and referrals. Clixsense has separate statistics sections for clicks, surveys, tasks, checklist and referrals that are updated instantly. Apart from that the overall transaction history make it easy for us to find the all the credit and debit transactions made for activities done by us and by our referrals. The reports are available for both free and premium member. Neobux PTC statistics section is very poor and will be very tough to understand for beginners to find ads with various rates. Apart from that no other statistics section is available on Neobux. Premium members have access to advanced statistics which has nothing to do with standard members.. Score : Clixsense – 5 | Neobux – 2. Forum section is a must for PTC sites for several reasons. Active forum will be helpful to confirm that the particular site is legitimate. Sites that has restricted forum will show that the site is scam or might become a scam in future. Both Clixsense and neobux forums are proactive. Questions are answered instantly on both these sites. Neobux Forum moderation is very strong. One wrong post should be enough to get our account disabled by moderators. Score : Clixsense – 5 | Neobux – 5. Both clixsense and Neobux has a rewarding game called clixgrid / Adprize. Let us see which is better. Clixgrid by clixsense is a game through which a member can win up to $10 per game play that is similar to PTC task. The member has to click the image and watch an ad. At the end there are chances to win prizes up to $10. Its a known fact that we will win such games once in a blue moon and at the end if we calculate the click rate might be even equal to just $0.0001. The click : win ratio is already programmed and it has nothing to do with luck. Standard members can play up to 30 times a day should view an ad for 10 seconds without captcha solved. Premium members can view up to 60 ads per day should view an ad for just 5 seconds. So, premium members have higher chances to win clixgrid as they have more chances to play. Neobux adprize is similar to clixgrid, where the chances depends on the number of PTC ad viewed. For every PTC ad viewed we get 4 ad prizes. Ad prize ads are similar to PTC ads should be viewed for 5 seconds and at the end we might win coins, points, cash or even a free account upgrade. Chances to win rewards on adprize is very low compared to clixgrid, but we can watch two adprize ads at the same time we use to watch one clixgrid ad. Scores : Clixsense – 2 | Neobux – 2. It is very important for a company to reward their hard working members with extra bonus. This will encourage the members to work hard to earn more bonuses which also improves the conversion rate of the company. Clixsense has generous rewarding terms that help their members to earn up to 16% checklist bonus from their daily earnings. To earn bonus, members should click at least 6 ads, 20 clixgrid and 2 offers/surveys or 10 micro tasks. So, if a member earns $10 doing some activities, by the next day he will receive up to $1.6 for free. This will highly boost the monthly earnings if completed everyday. Apart from daily checklist bonus, clixsense also rewards $5 for every $50 earned from Micro tasks and also $200 weekly contest for top 10 members who complete more tasks. Neobux does not give any daily check list bonus to their member. But, neobux rewards 15% bonus for standard members and 30% bonus for premium members every time when they earn $1 from micro tasks. Rewarding bonus instantly after earning $1 from tasks should be highly appreciated. Comparing both bonus terms I’ve come to the decision that clixsense bonus is better than neobux because, clixsense members have chances to earn daily check list bonus even though they do not complete any micro tasks and additional bonus for completing tasks and winning in weekly contest. But in neobux it is possible to earn cash bonus only if members complete micro tasks. Though the bonus is high compared to clixsense task bonus, it is almost impossible for most of the members to get eligible to access level – 1 tasks to earn more. With basic and important factors been discussed above, now it is time to compare critical factors which have direct influence on earnings. So these factors will be rated from 1 – 10. You might like this – Offline part time jobs. Paid to click is the primary task to earn money through PTC sites. Both on clixsense and neobux plenty of ads with different rates are available for members that varies based on the membership. Clixsense has 5 different types of ads with different rates [Refer table given below to find rates of each ad], where a standard member will receive atleast 20+ x $0.001 ads & 1 x $0.1 ad and a premium member will receive atleast 20+ x $0.001 ads & 4 x $0.01 ads per day. So, a standard member can earn atleast $0.05 per day from ads and a premium member can earn up to $0.15 per day from PTC ads. But a member from tier – 1 country have chances to earn more than $10 just by clicking PTC ads. One of the member from USA receives more than 500 ads per day and he earns $7 on average per day just by clicking ads. Look at the commission given below $1.4902 which is 20% of $7.451 [Earnings]. Refer the table given below to find the rates of clixsense ads. Neobux has 6 different types of ads with different rates [Refer table given below to fins rates of each ad], where a standard member will receive atleast 4 X $0.001 fixed ads & Golden member will receive 9 x $0.01 fixed ads & Ultimate member will receive 15 x $0.02 fixed ads. So, a standard member can earn only $0.02 per day from PTC ads and Golden & ultimate members have chances to make even more. Comparing Clixsense and Neobux, it is better to stay with clixsense for members who cannot upgrade their account on neobux because standard members will not receive any $0.01 ad on neobux regularly as they do on clixsense. Also the ad rates for both standard & premium members are same on clixsense where it differs on neobux. And for member who can invest in purchasing membership both clixsense and neobux are the best option. Score : Clixsense – 8 | Neobux – 7. Referral program is the only reason that runs PTC industry. Without referral commission no members can earn more than few cents a day as the result PTC industry would have been a great failure. By referring new people to PTC sites, the members will receive referral commission for every action made by the referral. Members will be very active to refer more people to earn more money which also brings more profit to PTC sites. In this section let us discuss which site gives reliable referral commission. Clixsense affiliate program is the best example for how the referral program should be. Their referral program helps both standard members and premium members to earn money from each and every click by referral. Also they pay up to 10% referral commission for surveys, tasks & offers. Clixsense referral program goes as follow. In addition, clixsense pays sign up promo up to $0.30 per referral and $2 when a referral earns $5 from tasks, offers and ads. Neobux referral program is only good for people who can invest money in membership. Standard members cannot earn reliable referral commission on neobux. Also, neobux referral program has several restrictions that include not paying referral commission for fixed ads [Pink], micro exposure and mini exposure. They pay only for certain types of ads which is available in less numbers. Not paying referral commission for most found fixed ads [pink] makes no sense. Why don’t neobux pay referral commission for all the ads. Apart from click commission, neobux pays 20% commission on offers and 10% for mini jobs /tasks. Comparing neobux and clixsense referral program it is clear that clixsense is the best site paying generous referral commission for all the actions performed by the members. But neobux only pay commission for selected ads that will be available in less numbers for standard members and even for members who purchased basic membership. Score : Clixsense – 10 | Neobux – 5. We all know that as a individual member without referrals, only by clicking ads he/she cannot earn more than few cents a day. Integrating paid surveys on GPT sites will really boost the earnings of the standard members and affiliates. Surveys are known to pay from $0.50 to $5 up on successful completion. Let us compare paid survey section of clixsense and neobux. 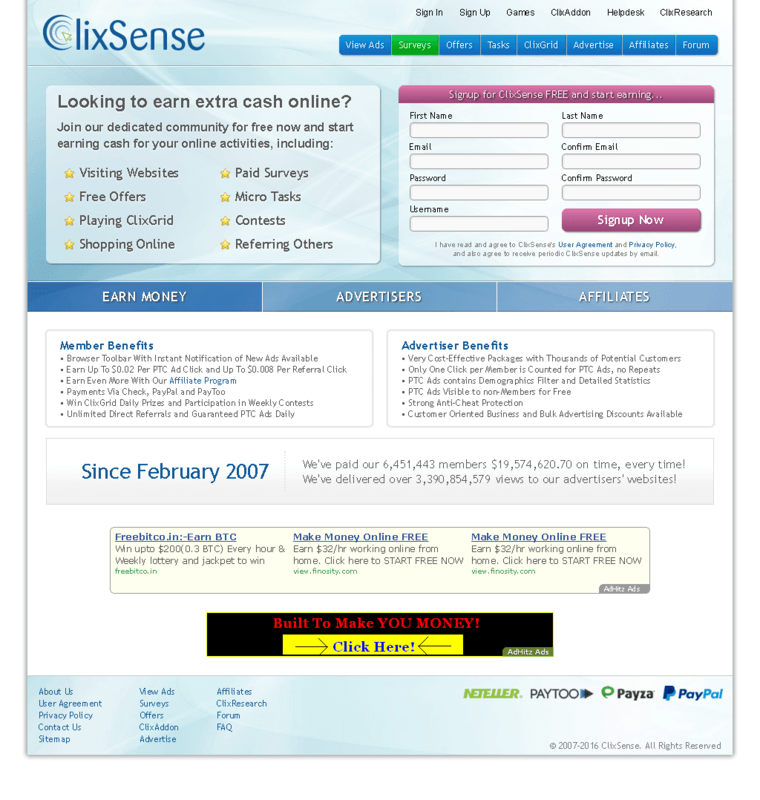 Clixsense has separate paid survey section, through which their members can earn by completing surveys. The number of survey invitations we receive & rate per survey will be high or low depending on our geographical location. US members will get several high paying survey compared to African, Asian members. Proactive US, UK, Australian members with standard membership are making more than $10 per day as an individual. Members from other countries can make from $1 – $10 per day depending on the number of surveys completed. For members who don’t receive survey invitations regularly, survey routers will assist them to find surveys. Clixsense pays upto 10% referral commission for surveys to the affiliates. Unfortunately neobux don’t have any paid survey section that is a great disappointment for members without referrals for whom it is impossible to make any money from neobux other than tasks and PTC ads. Clixsense has proven its reliability by adding paid surveys section which highly boosts the member’s earnings especially for members who struggle to make referrals. Score : Clixsense – 10 | Neobux – 0. Micro tasks / crowdflower tasks which is otherwise called as mini jobs on neobux is an additional section added on almost all the GPT sites including Clixsense and neobux. Tasks helps members to earn even more than $10 per day if they can do it with certain accuracy. Not all the members get access to level 1 – 3 tasks makes it unreliable. Number of tasks, categories of tasks, levels are all same on Clixsense and neobux since it is powered by crowdflower on both websites. But the pay rate per task varies which is controlled by the hosting sites. When compared, I found that Neobux pays more money than clixsense for completing tasks. Also they pay higher referral commission to both standard members and premium members compared to clixsense which is 12% on neobux and 5% – 10% on clixsense. Tasks can be accessed only from anyone of the GPT site per computer as per crowdflower terms. So, in this case you can work on neobux to earn more money through tasks/mini jobs. Recommended link – Learn how I earned more money from micro tasks. Score : Clixsense – 5 | Neobux – 10. Offers are additional ways to earn money on GPT sites. In addition to clixoffers on clixsense, there are several offerwalls available on both these sites to boost the income. Actually, offers earning is not reliable compared to paid surveys and tasks. Watching videos, downloading apps, palying html games are some examples of offers which varies from country to country. Clixsense pays clixcents for completing offers. One clixcent is equal to $0.01. For completing offer the clixcents will be credited directly almost instantly, if not within few hours. Offers on clixsense will be very useful for people to complete checklist bonus. There are over 10 offerwalls on clixsense including clixoffers powered by clixsense. Neobux pays coins for completing offers. The minimum of 2500 coins can be used to redeem to $2 cash. On neobux coins are credited only after 2 months after completion of offers which is almost instant on clixsense. Also there are no bonus for completing coin offers on neobux. So, there is no meaning to complete offers to make few cents that would be credited only after 2 months and should wait till coin balance reaches 2500 to redeem. There are over 7 offerwalls on neobux. Completing offers makes no sense, because we might earn only get few cents for completing offers unless we make any purchase. Downloading apps might make our smartphone clustered. From my view one [Other than US/UK residents] can complete offers on clixsense to earn daily checklist bonus. Completing offers on neobux is a waste if you’re not going to upgrade your account. Score : Clixsense – 6 | Neobux – 3. Referral program is the blood of PTC sites. With no referral system PTC sites will not sustain more than a day. Direct referrals are the members who has been referred by a member/referrer using his/her referral link. The referrer will be paid referral commission each time when his/her referral views ads, completes offers & tasks and upgrades their account. Clixsense’s referral program is one of the best among GPT sites. A member can have unlimited direct referral on clixsense, means there are no restrictions in how many members we can refer. Clixsense pays referral commission up to 8 levels. For first level referrals we get up to 20% commissions from PTC ads, 10% commissions from tasks, offers & surveys and $2 upgrade commission. For remaining 7 level referral we will receive only $1 when an indirect referral upgrades his/her account. Neobux referral program is the worst ever in PTC industry. We are allowed to refer limited number of direct referrals which is depends on the membership [refer section – 16]. A standard member can refer only 30 + total days from the account registered / 4 and golden member can refer only 60 + total days from the date of registration / 2 and at last ultimate members can refer unlimited members which costs really high. Restricting number of referral is done to directly pressurize the members to upgrade their account to increase the referral limit. Neobux pays only one level referral commission which is up to 50% commission for PTC ads [only for selected ads], 20% for coin offers, 12% for mini jobs and variable upgrade commission depending on the membership purchased. Undoubtedly clixsense is the winner when it comes to direct referral system that is profitable for both standard members and premium members. Neobux direct referral system is a trash that has no use for standard, Golden [lower upgrade] members which is almost non-profitable, time wasting system. 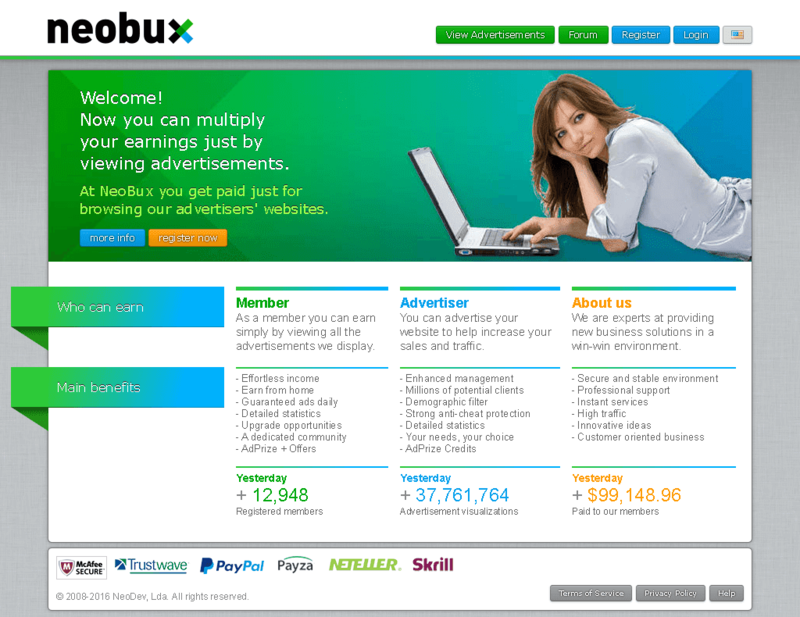 Also to earn referral commission on neobux we must click atleast 4 ads (standard membership) / 9 ads (Golden membership). In case of clixsense member’s activity is not necessary to get referral commission credited. Score : Clixsense – 9 | Neobux – 1. Rented referral system is available on almost all the bux sites. For whom getting direct referrals is still a dream and members with tons of direct referrals to improve their earnings renting referrals for money is an option available on bux sites. Renting refs is a risky process because there are high chances for referrals to become inactive which will be a great loss as we invest some money in renting refs. Seeing PTC history, there were several sites rent bots instead of human. Clixsense says that renting referrals is a bad practice where there are high chances for a referral to become inactive, the buyers might loose their money for nothing. Neobux has great renting referral system and believe that they might not cheat their members by selling inactive referrals. After working on neobux, I found that they sell referrals who are active for certain number of days and this does not guarantee that those referrals will be active. Inactive referrals can be auto-recycled once every certain days based on their membership. Neobux rented referral commissions is higher than direct referral commission. Neobux has several restrictions in renting refs like limiting numbers, less commission that forces their members to upgrade their account to make reliable money. Though renting referral system is considered as pitfall used by bux sites to cheat their members by selling fake referrals. Hope neobux is somewhat different from other sites. Few neobux members are making several hundred dollars by renting refs after purchasing high cost ultimate membership, mentioned on their forum. But many complaint that they are loosing money by renting refs on neobux. Its wiser not to invest more than what we can loose. As clixsense do not sell referrals, neobux deserves to be the winner of this section. Score : Clixsense – 0 | Neobux – 7. Premium membership feature on PTC sites helps the members to double their earnings. Members can upgrade their account by purchasing premium membership. Both on clixsense and neobux we can upgrade our membership to make money money. Again clixsense upgrade cost is the most effective one in PTC industry. A member can upgrade his/her account just for $17/year or $30 for 2 years. Clixsense is dare to say that members who cannot refer, complete daily checklist bonus and complete tasks & surveys they have nothing to do with premium membership. This shows clixsense is not forcing their members to purchase membership. With click rate same for both standard & premium members, clixsense proves that they treat all the members equally. Coming to neobux, the membership upgrades are very costly compared to clixsense and there is no guarantee that a member can recover his investment. There are two level upgrades available on neobux. First the member has to purchase Golden memberships which costs $90 to upgrade his/her account and then he/she can purchase second level membership which starts from $290 (Emerald membership) to $890 (Ultimate membership). Only ultimate members can refer unlimited direct referrals and rent up to 4000 referrals. There are several restrictions if we have purchase memberships that includes account should be 30 days older, should click at least 100 ads. Clixsense upgrade packages are very affordable. A member can earn $17 within 10* days by completing tasks & surveys and use the earned money to upgrade their account. So, there are very minimal chances for someone to loose money on clixsense other than inactive members purchased directly using Payment processor. Also the premium membership will be very useful for member both with and without referrals to boost their earnings. Even basic membership of neobux is very costly compared to clixsense that costs $90 which has several limitations. To earn more money the members have to purchase an additional membership, which costs minimum $90 + $290 and apart from that the members have to invest in renting referrals. Clixsense is the safest place to invest and neobux investors should be very cautious all the time. Score : Clixsense – 10 | Neobux – 1. GPT sites with more payment options will help members from all over the world to withdraw their earnings at low fees. PayPal is the most used payment processor in the world. But there are several restrictions for using PayPal in various region. So, it is the responsibility of GPT sites to add more payment options to send payment to their members. Clixsense process payments via 5 payment methods that includes PayPal, Paytoo, Payza, Neteller and Check [for US members]. The minimum payout is $8 for standard members and $6 for premium members. US members can withdraw their earnings through check as soon as their account balance reaches $10. Clixsense will send payment within 5 days from the date of request. Neobux send all payments through PayPal, Payza, Neteller or skrill. The minimum cashout is just $2 for first and then the limit increases by $1 until the minimum payout reaches $10. Neobux will send the payment instantly once we request payout. Comparing payment methods of neobux and clixsense, both have included most used payment methods. When it comes to speed neobux is the definite winner. Clixsense should improve their payment processing speed. Score : Clixsense – 7 | Neobux – 9. I’ve compared almost all the features and earnings methods of clixsense and neobux. I’ve been working as a member on both clixsense and neobux for several years and I hope this review is very genuine. Clixsene is a GPT site has very good site design and their support is really awesome. There are several earning features available on clixsense where even a standard member can earn money equal to the premium member with opportunities created equally. Upgrade fees is really low and affordable. The paid surveys section is a great plus point for clixsense that helps their members to boost their earnings exponentially. Clixsense affiliate program is very generous, there are no direct referral limit and no indirect forces are applied to make members to purchase premium membership. Neobux is a bux site that has incredibly fast loading site with great support. The earning features are very low compared to clixsense and lack of paid survey section makes it unreliable for members who can’t refer. Neobux tasks reward is the highest compared to anyother GPT sites. Their terms like direct & rented referral limit, put direct force on members to purchase premium membership which costs very costly. Standard members do not get high paying PTC ads ($0.01) regularly. In this table, scores of all the features are compared. Now its time to compare overall scores of these sites. There is a huge difference in comparison scores with clixsense scoring 99, neobux struggles at 71. Both Clixsense and neobux are legitimate PTC sites. Clixsense has proven that it is the best site to earn money without investment which a great news for beginners starting with no money to invest. Also, there are so many features like paid surveys, tasks available on clixsense helps us to earn without referring one member. Neobux is the site for people who can purchase costly membership, rent referrals. There is nothing available on neobux for beginners, if they cannot invest money. Mini jobs on neobux is good but only talented get access to high paying tasks. Megatypers vs 2Captcha vs Protypers – Captcha entry. PAYPAL VS PAYZA VS PAYONEER GLOBAL PAYMENTS COMPARISON: WHICH IS BEST FOR YOU?